Are you planning a trip to Salt Lake City, Utah? Whether you’re coming our way on a business trip or to enjoy some vacation time, you don’t have to blow your entire travel budget on an SUV rental. With one quick call to Affordable Rent-A-Car and Sales, you can find just the SUV rental you need at a price you can afford (our name says it all). In fact, here’s what you can expect when renting a car from us. 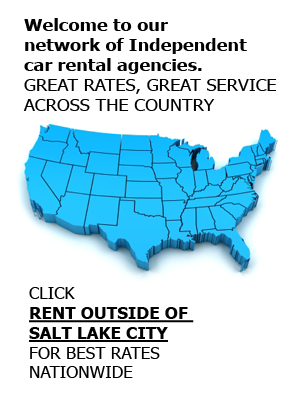 Affordable Rent-A-Car is a Salt Lake City-based rental company that’s both family owned and operated. Since we first opened our doors, we’ve worked hard to show our customers that renting a quality car doesn’t have to be expensive. We want our customers to feel like they got the rental car, SUV, or van they need at a price that they can afford. No matter why you need to rent an SUV—whether for a business trip, a vacation, or an insurance replacement—we’ll make sure you get a good car at a fair price. We carry more than just one make and model of SUV. From compact SUVs to larger premium models like a Chevy Suburban, we have them all. SUV rentals are popular here in Salt Lake City, especially for those visitors who plan to hit the nearby slopes. All our rentals offer comfortable seating, easy drivability, storage space, and the standard amenities (heating, AC, automatic transmissions, and more). To find out about all the amenities, we recommend that you contact our staff to inquire about a specific size SUV. Are you wondering whether all this talk is too good to be true? Get a free SUV rental quote from Affordable Rent-A-Car and Sales today by calling (801) 266-7368. We’d be glad to tell you all about our company, our rentals, and our current rates. When you’re ready to make a reservation, you can do so over the phone or book online at your convenience.